Space in the Guilford Building is leased by the square foot. The following standard definitions and lease rates apply to all tenants leasing space inside the Guilford Building. These definitions and lease rates do not apply to rooftop, basement, bank area space, or to street-level shops. Leasable area is defined as the number of square feet in the space to be leased and is measured at the longest length and the widest width of the area. Measurements are taken at the outside of exterior walls and the middle of interior walls. This method of measurement is sometimes called the New York Method and is widely used throughtout the United States as well as in the immediate Greensboro area. Common area is defined as general-use space which includes hallways, restrooms, lobbies, and elevators outside leasable areas. Each tenant pays for a proportinate part of common area, which amounts to 15% of a tenant's leasable area. 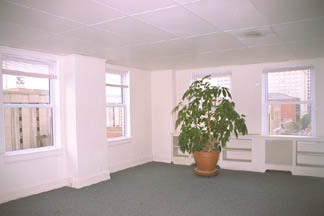 A conference room is available to tenants at no additional charge. Management reserves the right to partition space as it deems necessary. Opt for clean, well-lit, open office space or work with the on-site management team to customize space to suit your particular needs. 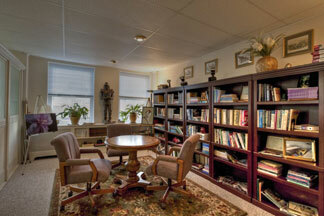 To see more images of office spaces, please visit our gallery page. The Guilford Building accommodates technological advances for its tenants. Offices are telephone and modem ready. ISDN, T1, and optical communication lines are available. Large amounts of electricity come into the building from redundant sources. 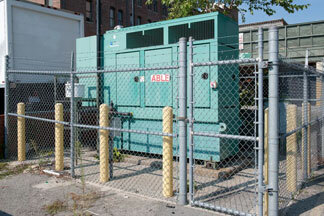 Backup generators and batteries can be accommodated for critical applications. Tenants who require satellite installations can use the Guilford Building's flat, clear-view rooftop which offers prime antenna locations. Access to telecommunications services is made possible by in-building, fiber optic and network switching systems maintained by AT&T, Duke Net, and Time Warner. 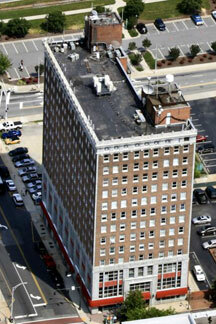 Clear Communications maintains a regional hub on the Guilford Building rooftop for wireless communications. 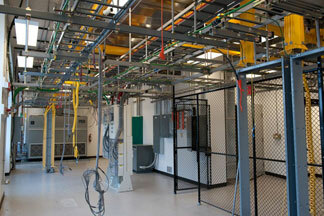 To see more images of telcom spaces, please visit our gallery page. The Guilford Building's geographic coordinates, physical elevation, demographic position, and flat, clear-view rooftop provide the ideal location for antenna systems. Managers at the building are experienced in helping engineers install new equipment, so it will operate at optimum levels without interfering with previously installed electronics. The Guilford Building is located in the center of Greensboro, NC, at coordinates (Nad 83) Lat: 36° 04’ 12.56”, Lon: 79° 47’ 25.52”. Greensboro, High Point, and Winston-Salem make up a region known as the Piedmont Triad, which occupies the north central part of North Carolina and is home to more than 5 million people. As one of the tallest buildings in the Triad, the Guilford Building rises 14 stories to an elevation of 985.2 feet above sea level. Centered between North Carolina's banking area at Charlotte and the research area around Raleigh, the Guilford Building is well-positioned to host systems such as PCS, trucking, FM radio, cellular telephone, fire and police, and low-power television systems. Currently, a limited amount of rooftop antenna space is available for lease at the Guilford Building. Inside floor space in the Guilford Building may be customized to house electronic equipment. Telephone switching systems, video processing systems, and communication systems may be located on floors below the rooftop antenna installations. Each such floor contains approximately 8,000 square feet. To see more images of antenna spaces, please visit our gallery page.